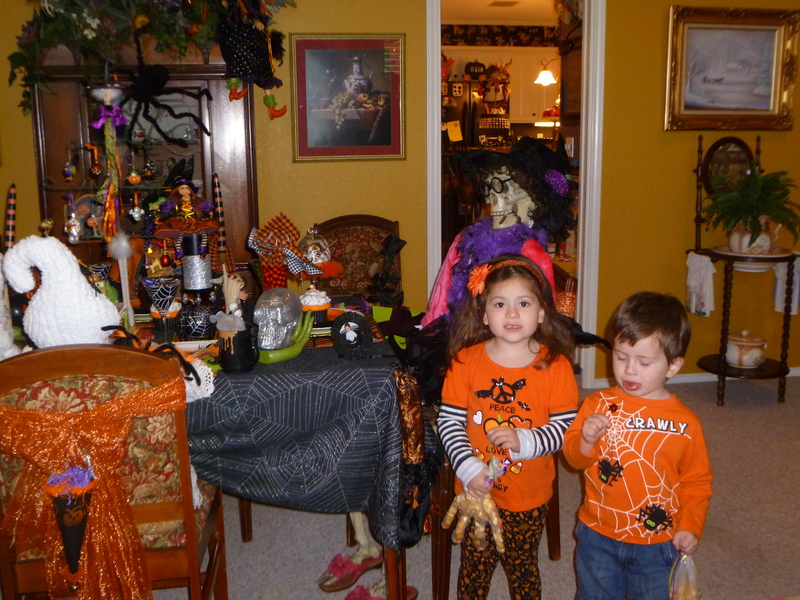 Halloween…….all through the House, more fun than Frightening! 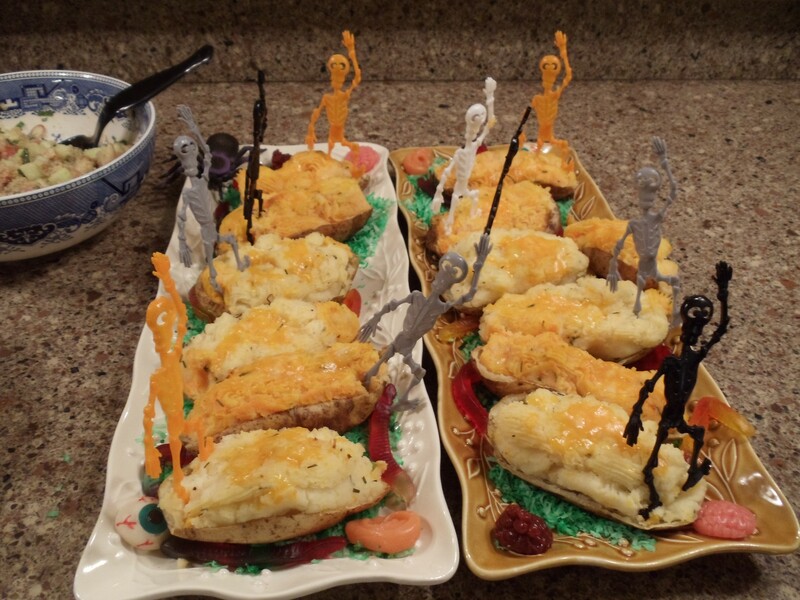 Beverly McClatchy loves Halloween. 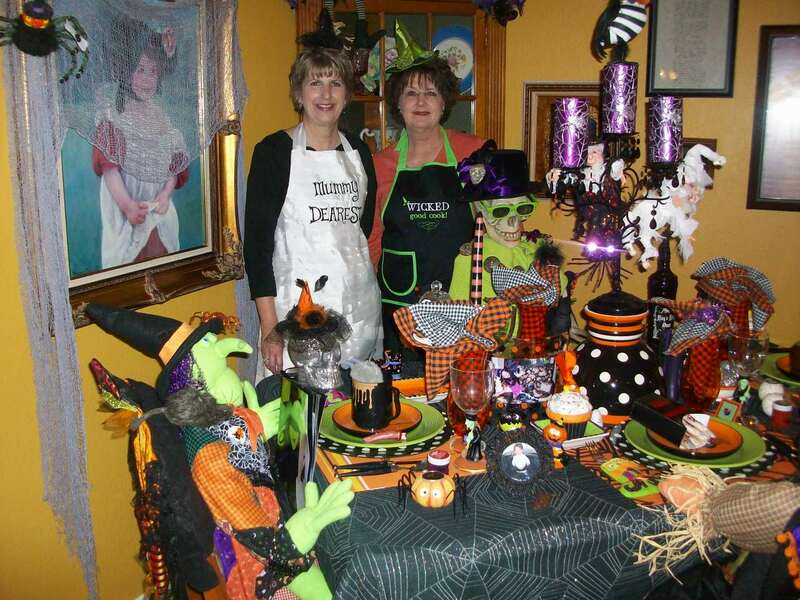 She started decorating when her son was young, helping with school carnivals. 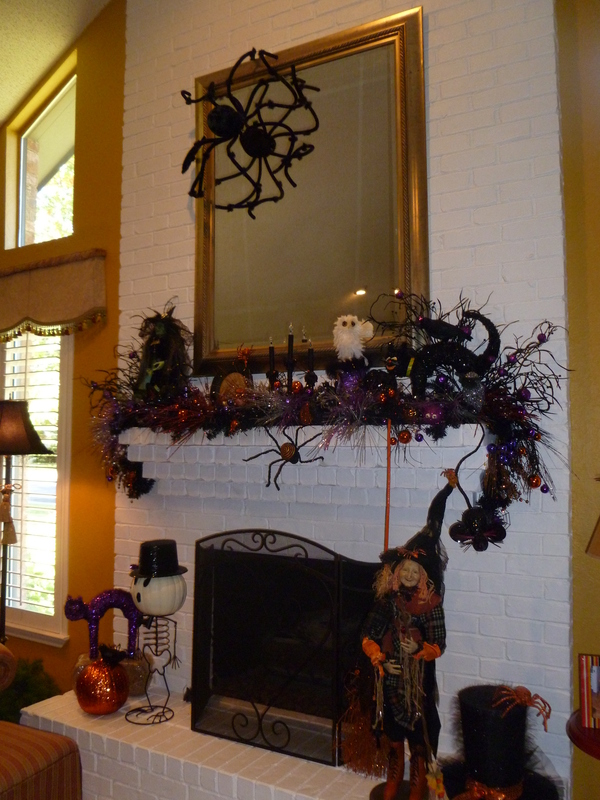 Her love of decorating spilled into her home and she began collecting Halloween and decorating from the front porch to the half bath and every room in-between. Now her passion is sharing with her granddaughter and creating traditions and memories with her. 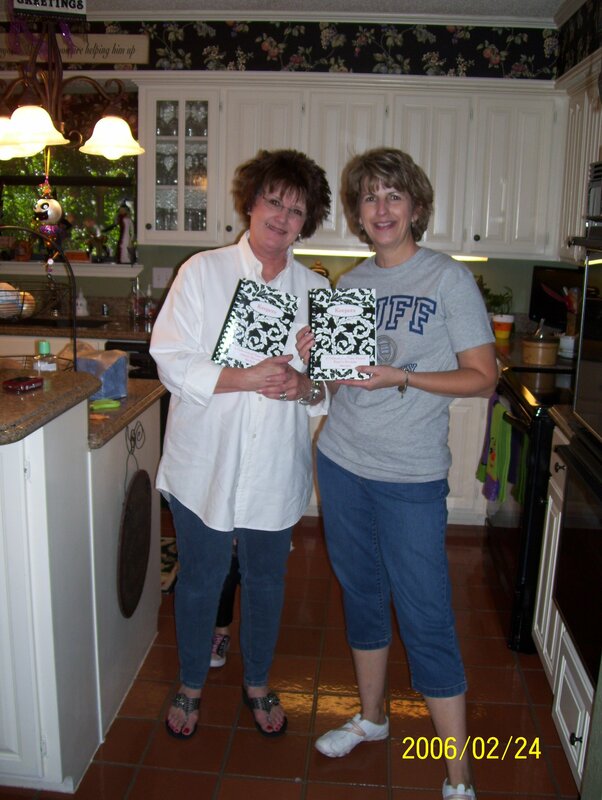 Listen in to the podcast as Beverly discusses with the Christmas Decorating Experts how she starts weeks in advance and carries the theme throughout the house, more fun than frightening! 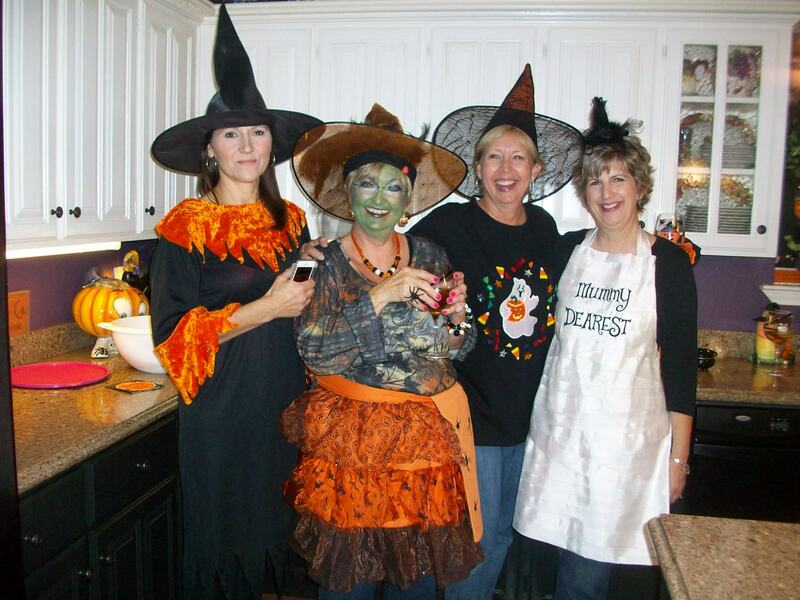 Stroll through Beverly’s house and don’t be spooked……. 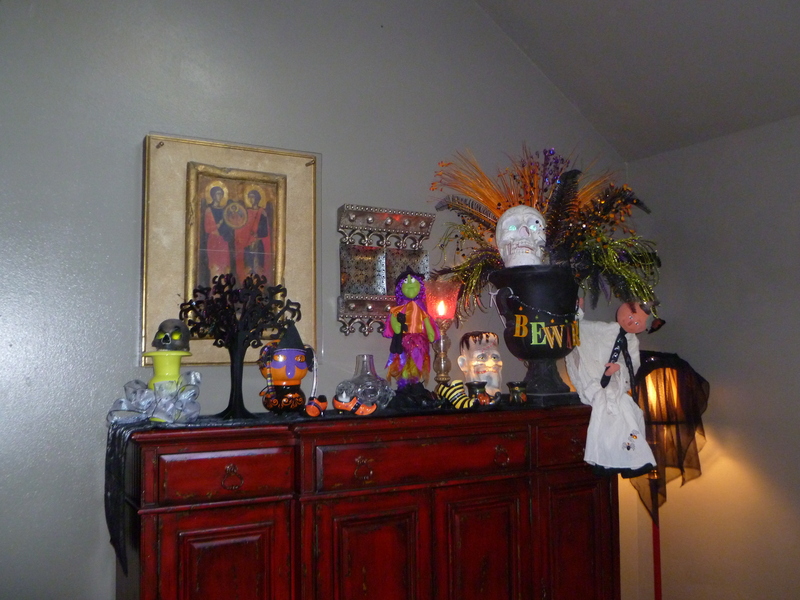 Halloween is front and center as you enter the house. She has chosen her entry table to display fun Halloween with pops of purple and lime green along with the traditional orange and black! Beverly loves to incorporate deco mesh! The bride has lost her head! 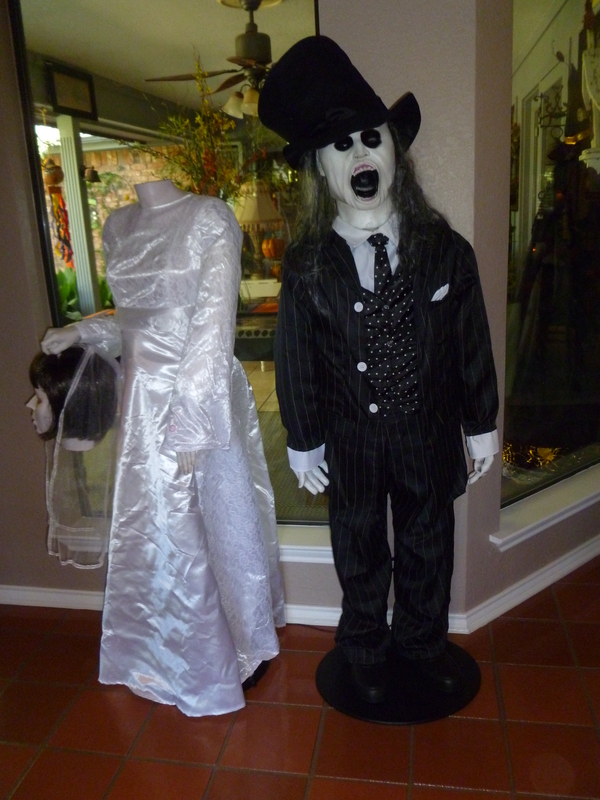 Halloween wedding couple! Beverly said het granddaughter even had them perform a wedding ceremony last year! It’s fun with kids imagination! The mantel is a great focal point! The large spider is creeping down the mirror! a witch,ghost and pumpkin complete the scene! 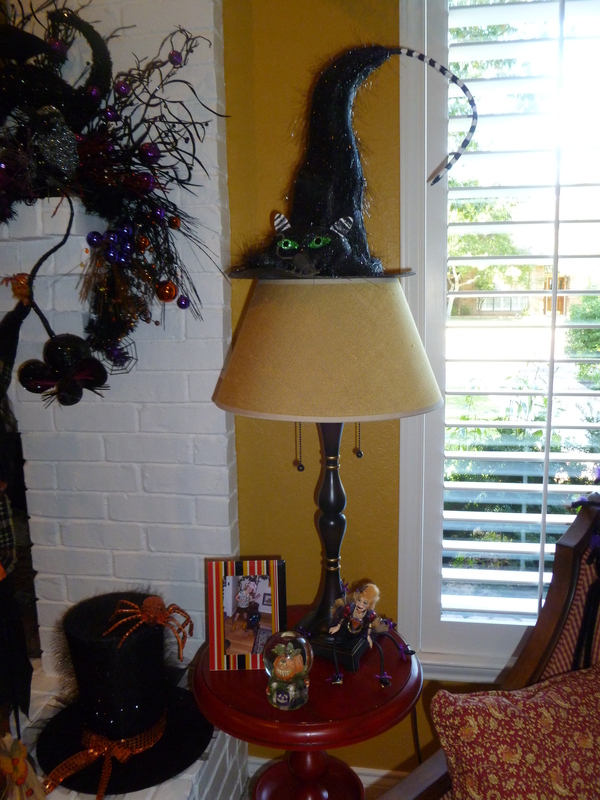 Even the floor lamp is transformed with a witches hat! The black top hat on the hearth adds another detail, along with her collection of sit abouts! 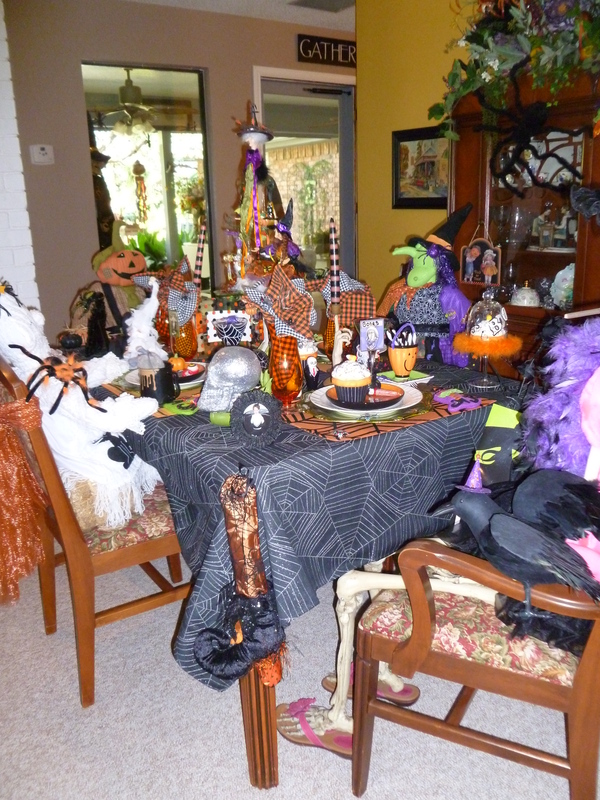 Beverly’s dining table is set for a party…a ghostly party, complete with characters! Even her granddaughters life-size doll is in costume. 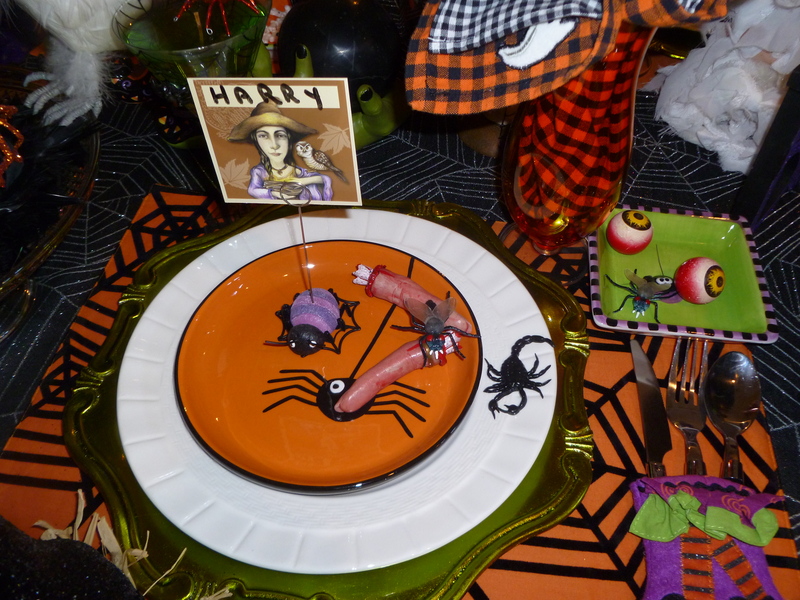 Spooky green witch parties with a scarecrow, skeleton wearing sparkly glasses and the ghost, all set for a ghoulish feast! Purple and hot pink dress this lady skeleton up for the Halloween festivities! 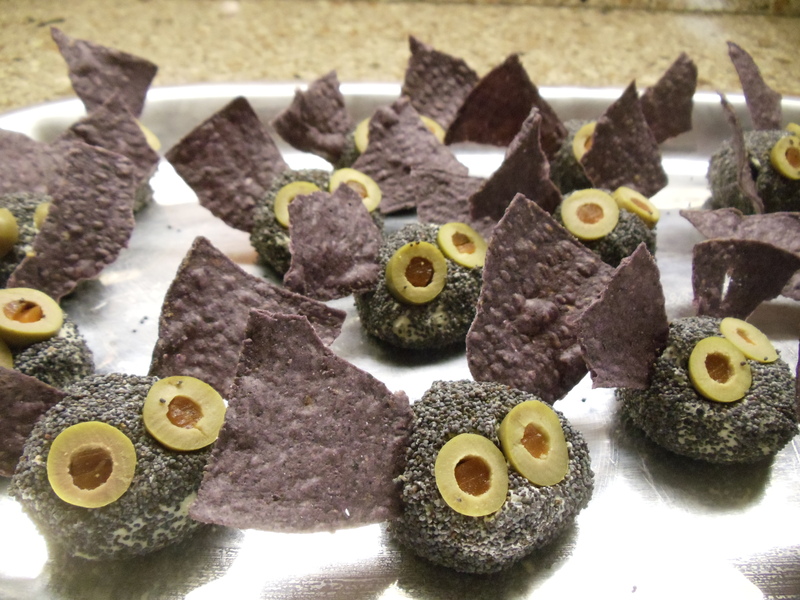 More whimsy and fun! 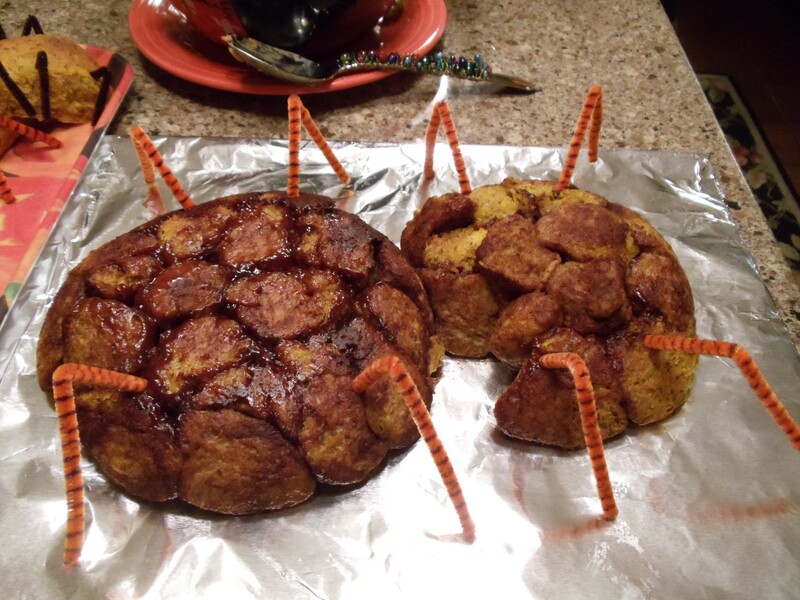 Creepy crawly ghoulish dishes are not for the Squimish! Fun colorful place mats,Chargers, tablecloth, place cards, and glass cupcake ornaments all are part of her vast collection. 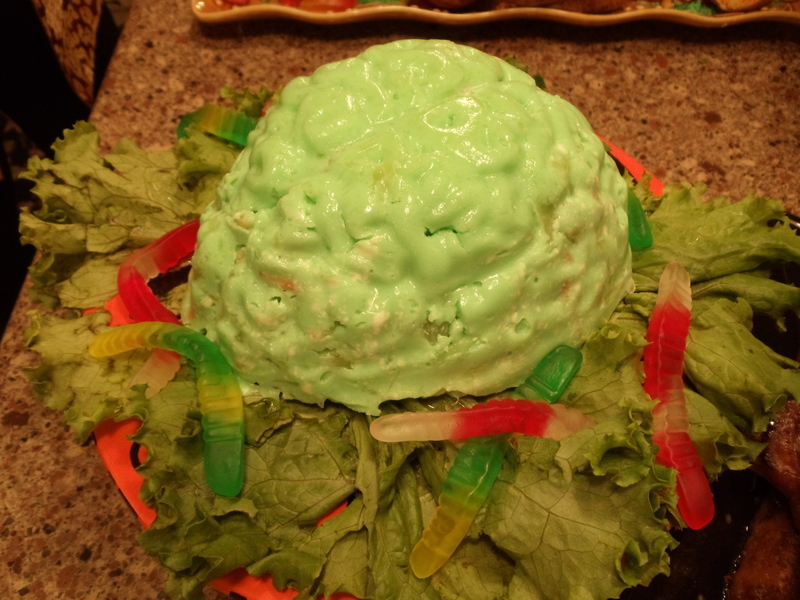 Who wants to sample the eyeballs and fingers for a snack? Bright orange feather boa, adorns the top of an antiques cabinet. 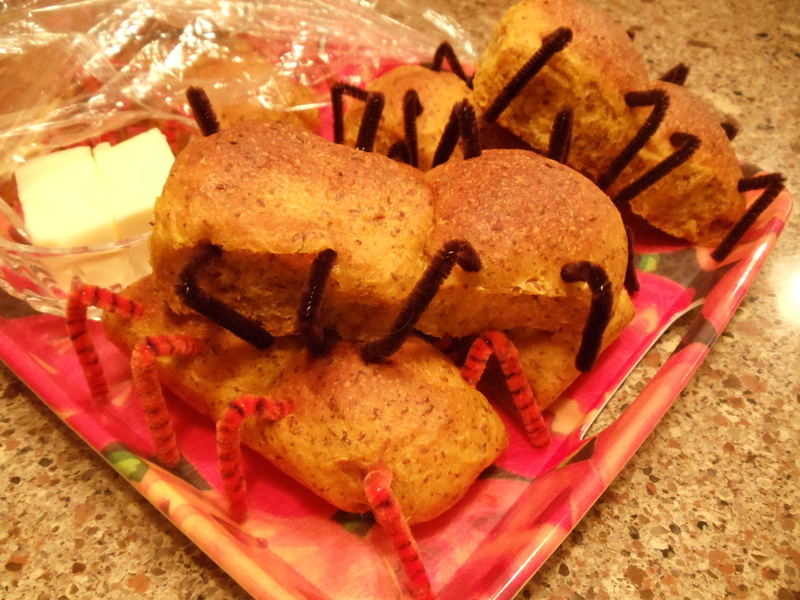 the purple striped spider is crawling down to sample the goodies! 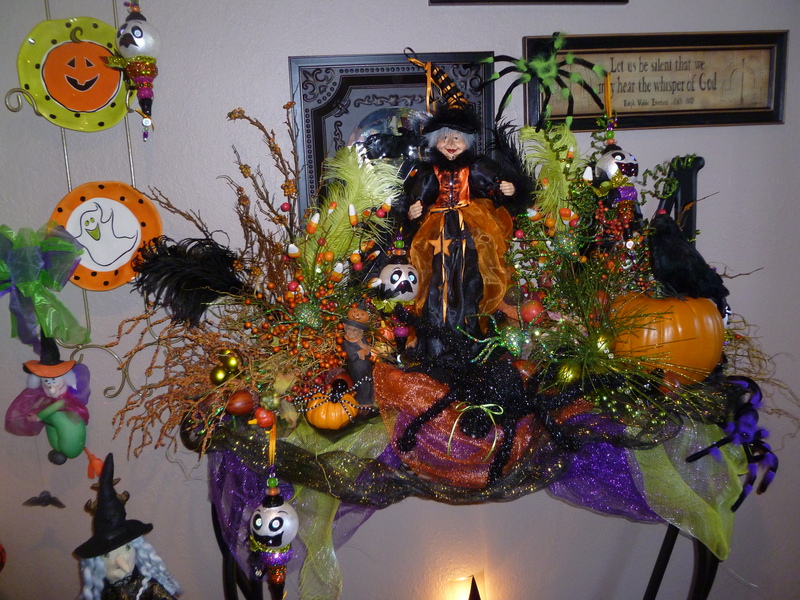 the fun collection of green witch, spooky ghost and hats all complete the vignette! 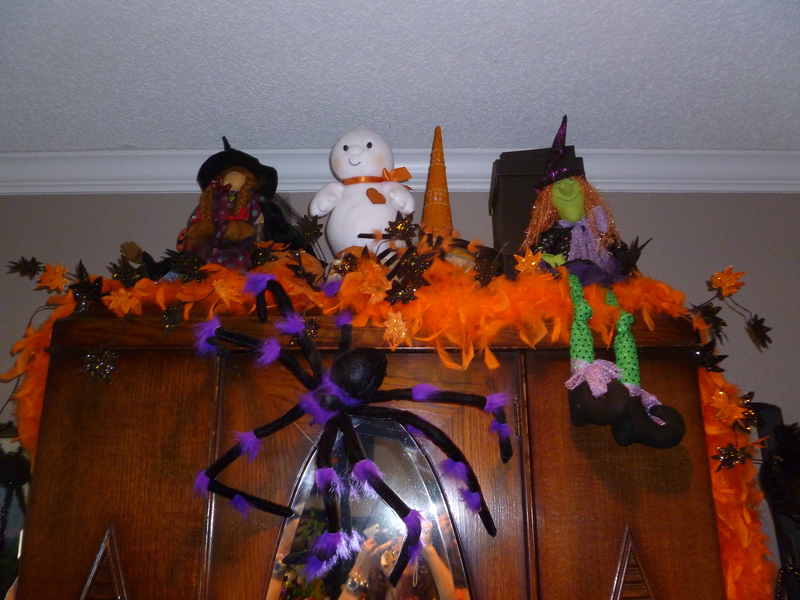 The base of the cabinet serves as another are to display more witches, a pumpkin head man and cute Halloween glass plates! A bright orange leaf garland is intertwined with purple and orange balls. 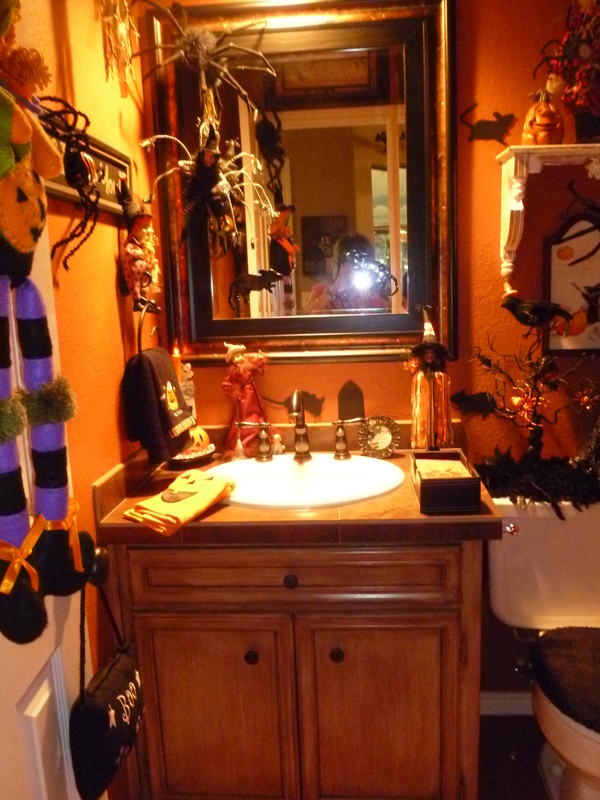 The half bath is painted a burnt orange, a perfect backdrop for Halloween. 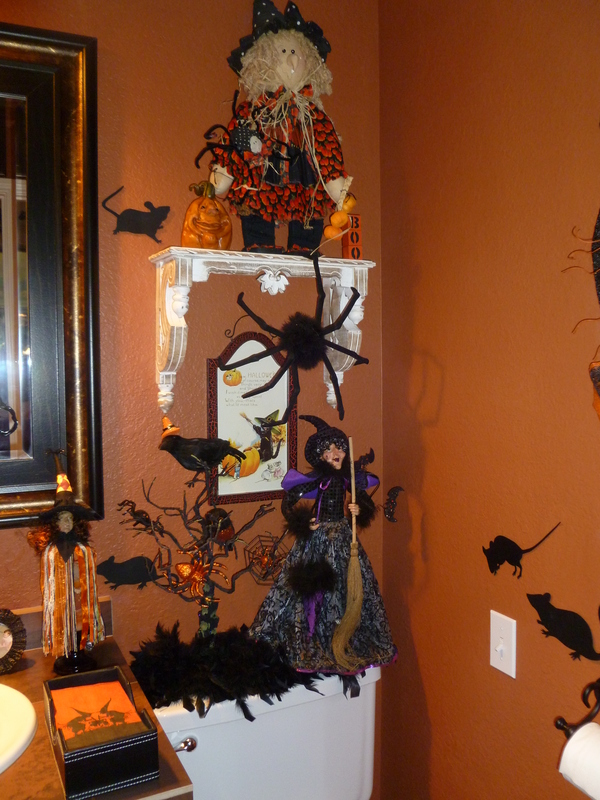 The mice decals attached to the wall add to the creepy crawly feeling of the spiders, bats and witches hats! 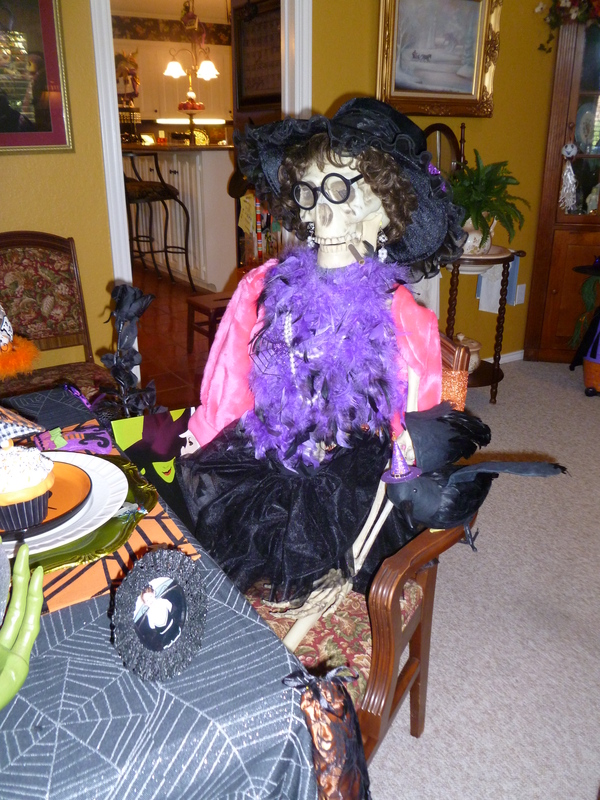 Beverly is not a scardy cat when it comes to Halloween, every room is decorated and most have a fun touch of purple! 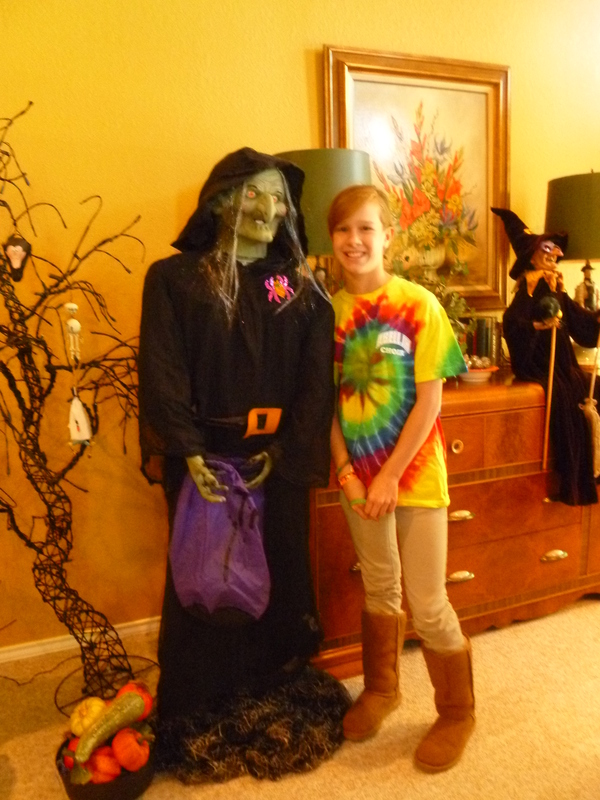 This life-size witch stands guard in the living room with her purple pouch filled with candy for the brave at heart! the knarledy tree lends a whimsical airy touch to complete the scene! Even the kids can’t resist the treats, especially the hand filled with caramel corn and tied with a festive bow! 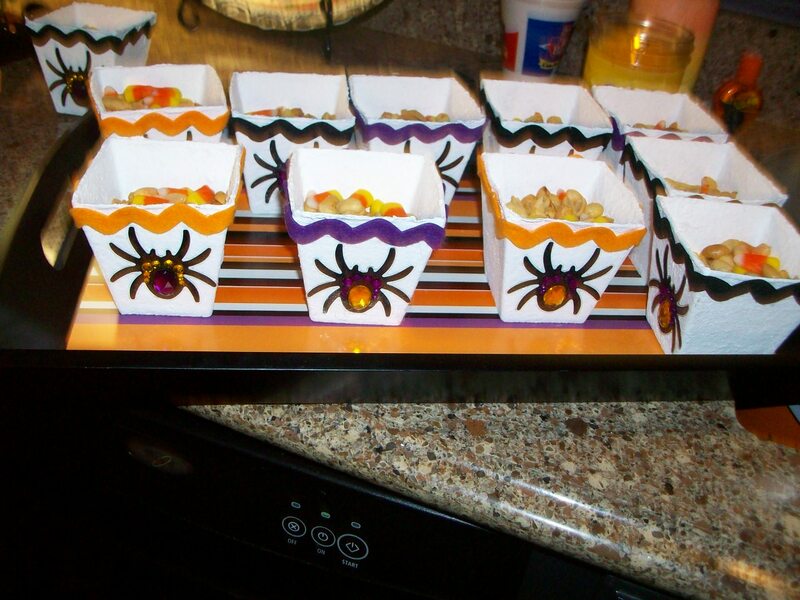 there is even a spider ring to wear after the popcorn disappears! 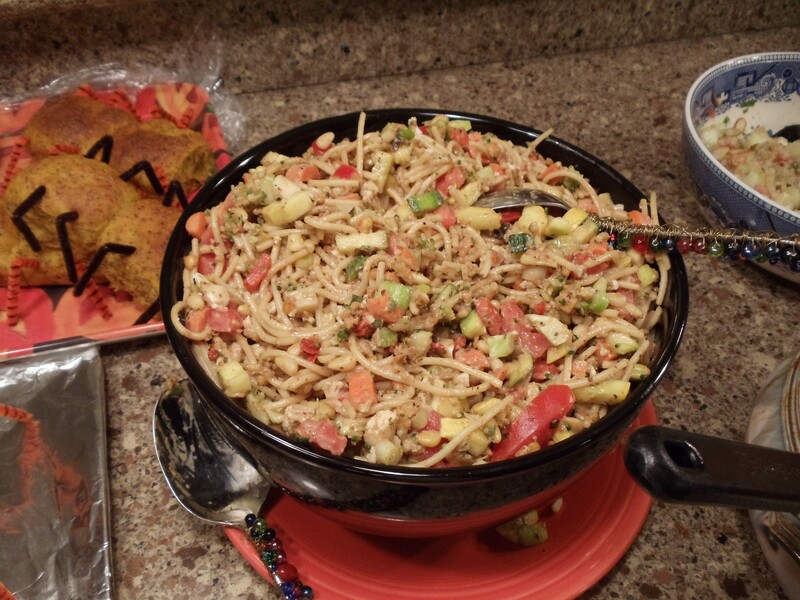 If this was not enough, we ventured over to the neighbors and one of Beverly’s close friend and crafting cohort, Gina and enjoyed all of her Halloween decorations and treats! 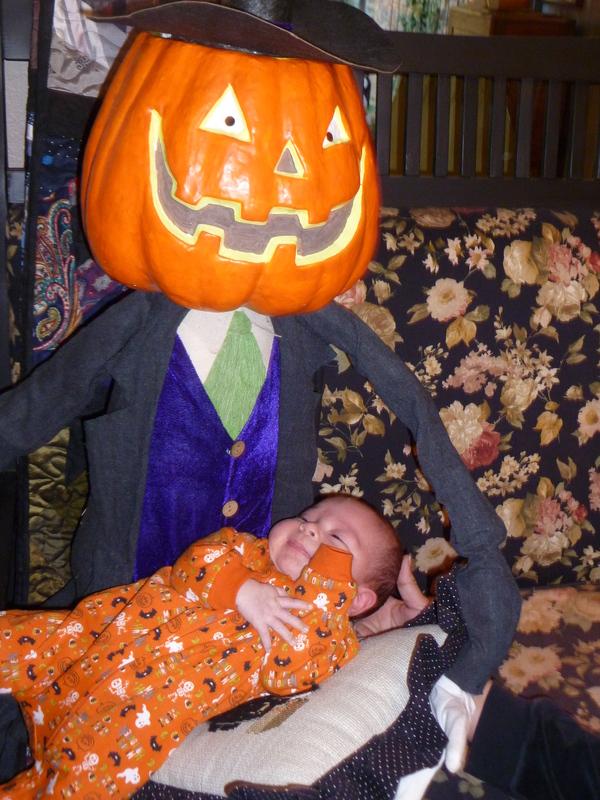 Who is ready for Trick or Treating? 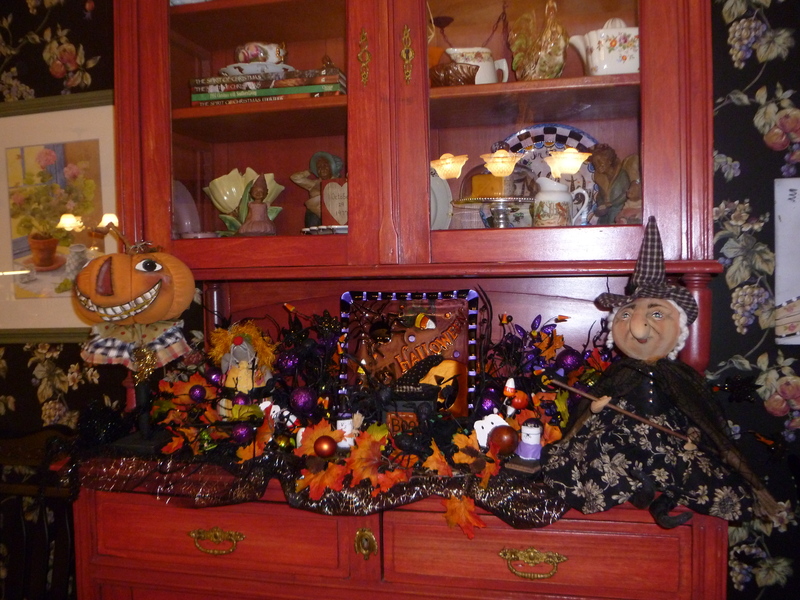 Gina’s colorful electic house lends itself well to whimsical Halloween decorations featured here on her buffet! Colorful feathers and a glittered skull fill a spooky black urn! 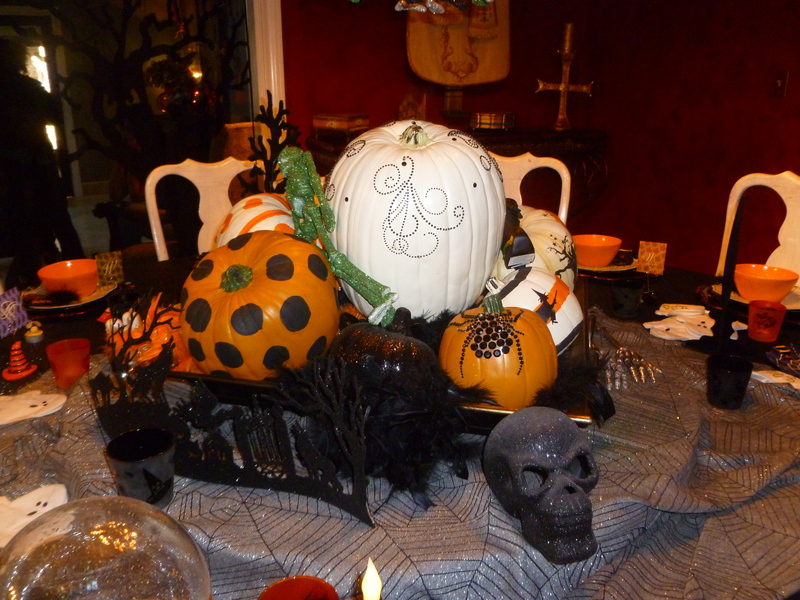 Gina’s round dining table is set, her centerpiece is filled with faux pumpkins she painted and embellished. the ghostly grey table runner grounds the vignette, don’t let the creepy skull scare you away! Halloween more fun than frightening lights up these favorite haunts! 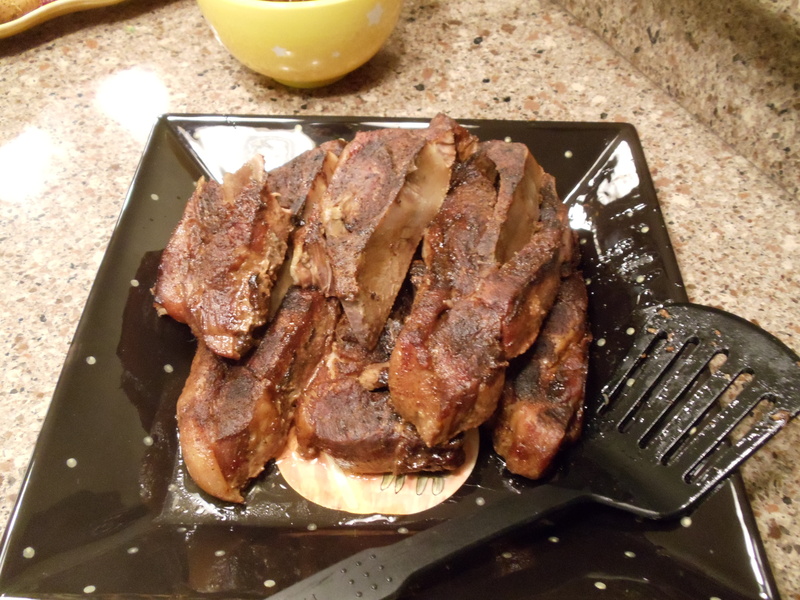 Have fun with your kids, make a treat, create a memory and begin a tradition! 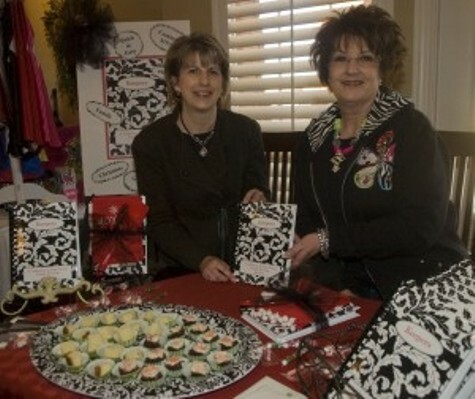 Miss Cayce’s Christmas Store in Midland Texas!